Christmas in Greece, originally uploaded by Teacher Dude's BBQ. People often buy lottery tckets this time of year. As I write this Greek users of Twitter are flooding the micro - blogging service with comments and complaints about the Apple reseller in Greece, Systemgraph. According to the newspaper Protothema, a Greek internet user is being sued for 200,000 euros by the company following complaints he made online about how his attempts to get his imac repaired went awry. 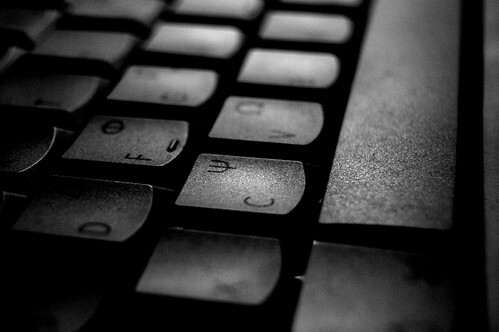 In his post blogger Arkoudos wrote that Dimitris Papadimitriadis, a 35 year old doctor, took his computer to be repaired by the authorised service provider, Systemgraph when he saw that shadowy areas on the screen. The company identified and claimed to have repaired the issue, however, when Papadimitriadis realised that the problem had not been fixed he returned his machine once more and then his troubles began in earnest. On the other hand Systemgraph stated in their defence that the customer had been "rude and aggressive" and that the company had offered to repair the screen once more and was under no legal obligation to replace the machine (that being the responsibility of the store that had sold the computer). According to their statement on the AV Club forum the law suit was in response to an "organised attempt to slander and insult" the company via social media sites, blogs and forums. This case in disturbing on two levels. Most importantly is the idea that any unwanted or disagreeble comment made on the internet can be punished with massive fines or the threat of legal action. As Papadimitriadis puts it on Twitter, "If the blogger/consumer loses (the case), then all we will be able to write in our own name will be recipes". The Greek state been wary of internet and especially the blogosphere since its inception. 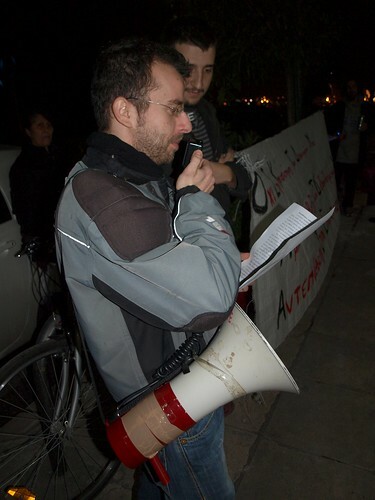 In 2006 Antonis Tsiropoulos, site adminstrator for the Blogme aggregation service was arrested for hosting negative comments concerning a prominent TV personality and ultra - nationalist. In a similar vein the conservative New Democracy government attempted to introduce legislation that would strip Greek internet users of the right to blog anonymously in 2009. Also what the case highlights is just how weak consumer protection is in Greece and that buying any big ticket item involves a risk which most other European consumers do not have to factor in. Even when the guarantee is valid some companies are loathed to accept the costs involved with repairing or replacing faulty goods. 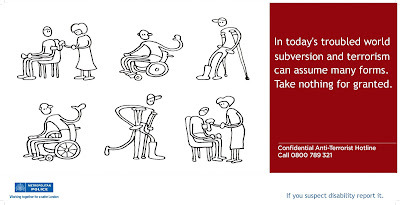 Of course, the consumer can insist on their rights as Papadimitriadis said he did when he took his case to the consumer ombudsman but this can be a long and often futile affair and even if the courts find in favour of the customer businesses can just chose to ignore the decision. Whatever the rights or wrongs of the case are the uproar which is currently being generated on the internet via Twitter and blogs shows that consumers do have the power retailers think carefully about how they are preceived online and remind them of the power of negative word of mouth. Latest North Korean pronouncements on the activities of Jody Mcintyre. Protesters outside Applebee's - Thessaloniki, Greece, originally uploaded by Teacher Dude's BBQ. 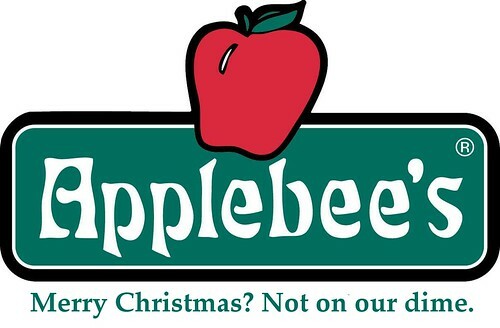 Applebee's describes itself as a "neighborhood grill and bar" but I'm not sure what kind of neighborhood thinks it's OK to leave people unpaid and short of money in the lead up to Christmas. Protesters gathered outside a branch of the Applebbe's restaurant chain in Thessaloniki, Greece last night to draw attention to the fact that employees have not been paid for November despite Christmas being just two days away. Eventually, a representative of Applebee's talked to demonstrators and promised that all salaries would be paid though not till 6th January. Greek protesters Vs riot police - Thessaloniki, Greece, originally uploaded by Teacher Dude's BBQ. As I write this Greece is getting ready to celebrate the Christmas season and as might be expected the central shopping areas are full of stores sporting decorations. Yet behind the festive fascade the reality of the situation is that this is going to be one of the worst Christmases in decades. With over 2 million Greeks (in a nation of 11 million) living below the poverty line and unemployment rising remorselessly many have little to feel merry about. To make things even worse the current package of austerity measures has yet to take full effect, promising to make 2011 even more difficult than the year about to end and in this climate of uncertainty people feel angry and afraid. They are deeply outraged with their political rulers who once again have led the country into crisis, though in this case on a scale unprecedented in modern greek history. Ex - government minister Kostis Hatzidakis was on the receiving end of popular outrage during last week's demonstration outside parliament and was beaten by an enraged mob who pursued him and his police guards lashing out with a level of violence not witnessed in decades. 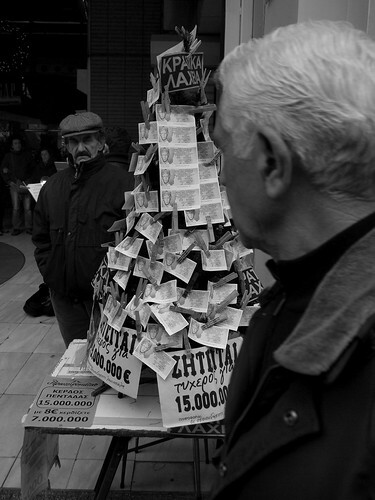 However, as many Greek commentators have argued the target of the mob's rage was not Hatzidakis himself but rather the political system in general which is currently in a state of crisis, a victim of the massive economic cuts being imposed by Greece's creditors in return for the 110 billion euro bailout package. Following prime minister's Giorgos Papandreou's second policy u - turn since gaining power in Septemer 2009 voters are feeling betrayed by their leaders who swore in pre - election campaigns that there would be no further cuts in wages and then within weeks slashed pay and lowered the mimimum wage. Greeks have long since ceased to believe the endless stream of statements from government spokesmen talking up suggestions that the economy will round a corner in the coming year as they have been lied to far too often for such ideas to be given much credence. Giorgos Papandreou has burnt through virtually all his political capital in less than 14 months, a feat unprecedented even in Greek politics and all that is left are a series of PR moves that convince an ever dwindling segment of the electorate. Last night the Greek parliament passed the 2011 budget which will see swingeing cuts in public spending and promises little or no help to the country's poor. For them the coming year is set to be a bare knuckle fight for survival in which many will be given no assistance at all by the state. Already here in Thessaloniki the signs of the coming social crisis are evident with pensioners rooting through rubbish bins and every set of traffic lights manned by beggers. On the other hand coaches full of riot police are now a permanent fixture in the centre, a vivid reminder of the threat of a resurgence of the violence that swept the nation in 2008. The danger is that with a political system so compromised by its rich history of corruption and incompetence Greeks will turn their back on the present set up and seek solutions elsewhere. Already many MP's, especially members of the ruling socialist PASOK party are worried aout the reception they will receive back in their constituencies over the Christmas break. The fact that despite days of intense political confrontation within PASOK over the budget not one of their MPs voted against it is likely to lower even further voters opinion of their parliamentary representatives and raise questions about just how democratic a country Greece is. When the party leadsership can ride roughshod over backbenchers and introduce legislation that the vast majority of voters do not support then what exactly is the role of parliament in representing the popular will? However, in Greece, more than most European countries the political arena is not just limited to parliament and passing a law is not the same as making it a reality. 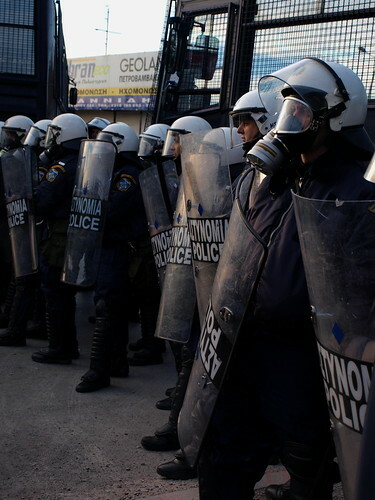 Riot police on duty during Greek general strike - Thessaloniki, Greece, originally uploaded by Teacher Dude's BBQ. This Thursday I was interviewed by the BBC World Service on people's reaction to the latest economic developments in Greece and how Greeks view the EU's efforts to deal with the current financial crisis. You can hear my answers here (31 minutes into the programme). Greek protester holding a mililtary grade stun grenade used by police to disperse marchers, originally uploaded by Teacher Dude's BBQ. Greek riot police used stun grenades designed for use by special forces in anti-terrorist situations to break up protests outside the ex-ministry of Macedonia and Thrace in the northern city of Thessaloniki yesterday December 15 th, 2010. "The Grenade Hand Stun N580 and Grenade Hand Stun Multi’s N582, N591 and N592 are diversionary assault grenades, designed for use in confined spaces by Special Forces during hostage release. Noise and candela levels induce disorientation in any persons within the effective range." 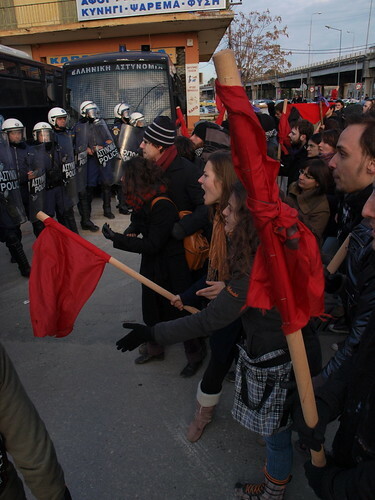 Greeks protest against new round of austerity measures - Thessaloniki, Greece, originally uploaded by Teacher Dude's BBQ. Yesterday's general strike meant that much of Greece came to a standstill as public transport, trains, airports closed as did teachers, health sector employees and many in the private sector. According to Greek General Trade Union Council, GSEE turnout was nearly 100% in many areas. The government's latest round of austerity measures which will see wages and benefits slashed in the near future has outraged many and is especially resented as Greek prime minister Giorgos Papandreou in the run up to November's local elections gave his personal pledge on several occasions that no such measues would be taken. 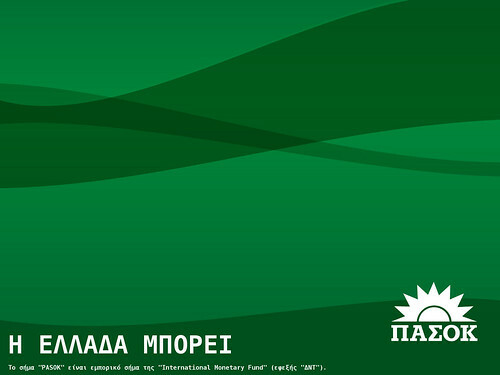 The feeling that the ruling PASOK party have reneged on campaign promises made in last year's national elections as well as the latest local council vote is now deeply rooted and is likely to grow as the economic measures demanded by Greece's creditors take effect in the coming months. It is a measure of the pent up frustration and rage that ex - minister Kostis Hatzidakis was beaten and narrowly avoid worse as he walked through the centre of Athens during anti-government demonstrations yesterday. While many Greek have nothing but contempt for politicians such an attack was unprecedented and seems to be the work of older protesters rather than more militant anarchist groups that often are in the front line of violent confrontations. While the TV news bulletins have attempted to play down the extent of the violence in Athens and other Greek cities the reality of the situation is that clashes between the police and protesters are growing steadily more violent and the period of relative calm that followed the tragic death of three bank employees burnt to death during demonstrations in May has come to an end. In Greece's second city, Thessaloniki about 15-20,000 marchers braved low temperatures to march in protest through the centre of the city, however, violence erupted when some groups tried to storm government buildings in Agiou Dimitriou St at which point police and marchers fought a series of running battles for over an hour with firebombs, rocks and tear gas being exchanged. 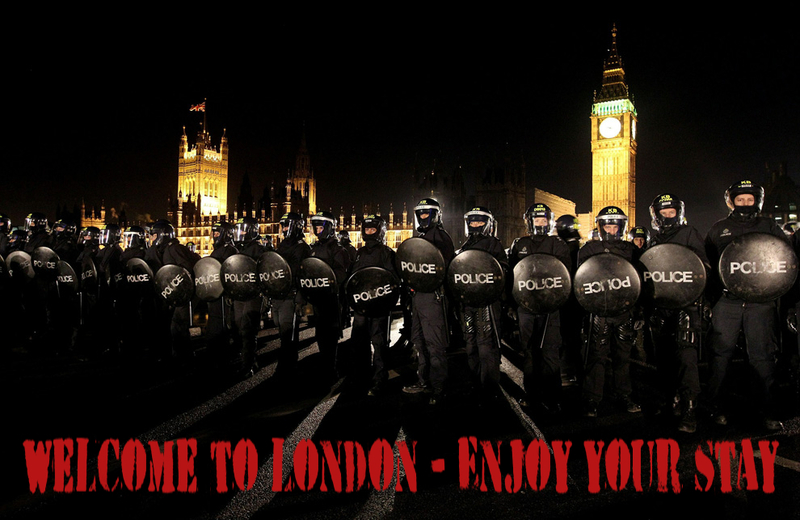 The police once again used stun grenades designed for military and anti-terrorism operations to disperse crowds. Later a smaller group with approximately 500 people marched out to the general police headquarters to demand the release of 20 protesters who had been detained by riot police earlier in the morning. Among those releases were several who reported injuries including head wounds. Yesterday the Greek parliament wAS in the process of debating a raft of new labour laws that would radically change the pay and conditions of most employees and is likely to trigger a fall in wages that will further depress living standards of most Greeks, perhaps pushing them back to levels not seen since the 80's. I do not know the outcome of the vote nor do I particularly care as the result is a forgone conclusion and in the final analysis the decision is not in the hands of elected officials in Athens but rather those of technocrats in the IMF, European Commission and the European Central Bank. What the ruling PASOK government cares to call the outcome of the vote is merely window dressing and should not be confused with anything resembling democratic process. However, away from the parliamentary puppet theatre the country today is set to come to a standstill as trade unions in the public and private sector have declared a general strike for today. Trains, buses, planes are not running and much of Greece's infrastructure has shut down for the durqtion. Across the country people are gathering to take part in protest marches and demonstrations as I write this, angry and disappointed by their rulers. I will be on the streets trying to take photographs and video of today's events and will be providing updates whenever I have internet access and time. To follow the events on Twitter use the #imfgr hastag. Most of it will be in Greek, of course but Google Translate does a good job of rendering Greek into English and other languages. Alternatively, you could use the following Greek words in your search engines and then translate. A spoofed version of the cartoon that appeared in Richard Littlejohn's Daily Mail column where he ridiculed disabled activist and journalist Jody McIntyre over his attack by police in London. In Ben Brown's interview with McIntyre the BBC presenter did his best to insinuate that McIntyre had provoked the police assault on him which saw him dragged not once but twice from his wheelchair during the UK student demonstrations last week. 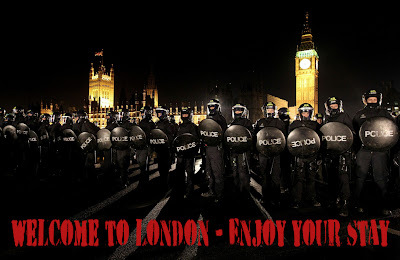 During the student demonstrations against the UK's tuition fees hike in London last week news that a disabled participant had been dragged from his wheelchair by the London Metropolitan Police spread across Twitter like wild fire. However, I was initially sceptical that this had actually happened as in such cases rumours, both real and unsubstantiated can be retweeted by many who do not check upon their validity. Even the photograph that was cited as evidence of the attack was less than conclusive as it was open to a number of interpretations. However, in the age of cheap video technology and Youtube it was perhaps inevitable that footage of the incident would come to light. In what was an appalling piece of gutter journalism a disabled person who'd been assualted not once but twice by the police was called upon to defend himself from accusations by a presenter who has obviously confused his role as a journalist with that of London metropolitan Police's defence lawyer. It is a disgraceful piece of biased reporting that was handled skillfully by McIntyre who calmly and rationally argued the obvious that a person in a wheelchair who needs assistance to move around does not constitute a threat to hundreds of police officers dressed in riot gear. The BBC interview is here. 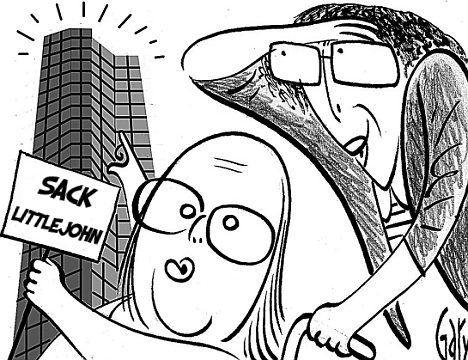 Jody McIntyre's blog is here and you can follow him on Twitter here. 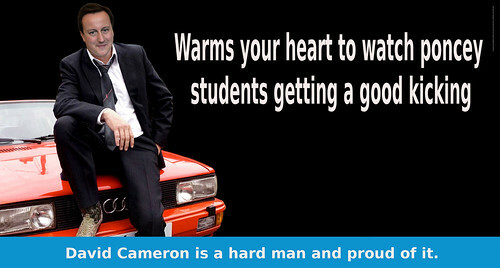 David Cameron speaks candidly about the recent student demonstrations, originally uploaded by Teacher Dude's BBQ. "Charles, the peasants are revolting. Too right, darling. Have you seen the state of that one?" The peasants are revolting. Too right, darling. Have you seen the state of that one?, originally uploaded by Teacher Dude's BBQ. 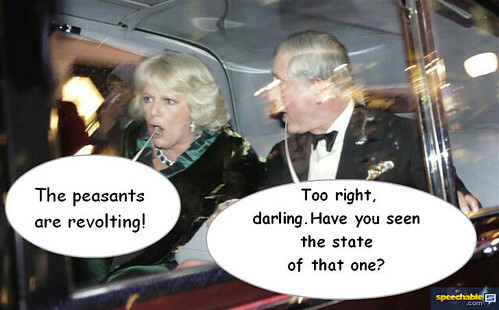 Prince Charles and Camilla caught in a candid moment following attack on royal vehicle by students in central London. Reporting in Greece getting tougher than ever. 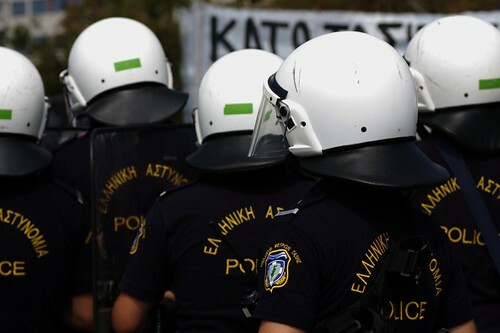 As the economic crisis in Greece bites ever harder the number of groups wishing to protest against government policies has also grown and with it the number of situations in which the police have been used . With this has come a worrying trend of police attacks on photographers and others covering the demonstrations and marches. The latest incident happened on Monday when Demotix photographer, Maxime Gyselinck was attacked by riot police during demonstrations in Athens to commemorate the anniversary of the police killing of Greek teenager, Alexandros Grigoropoulos in 2008. Despite telling the officer that he was a photojournlist he had his arm broken in the assault. 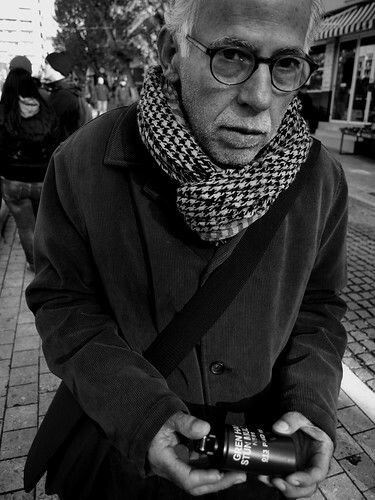 Fellow photographer Vangelis Patsialos was also assualted when he tried to help Gyselinck. This is just the latest in a series of incidents of police violence against photographers and camera operators in Greece. Just three weeks ago Aris Messinis was punched repeatedly by a motorcycle officer who he had photographed during a march. (The reporter made a note of the number plate of the motorbike the officer was riding and it also features in a law suits for a violent police raid on a legal aid centre for immigrants in Athens according to independent news service TVXS). In October camermen and photographers were needlessly attacked and tear gassed during a police operation to clear protesting employees from the Acropolis (see video here). And the list goes on, including many of the photoraphers who are part of the Demotix photography agency who have also been kicked, hit, and abused by police officers during the last year. In addition to running the risk of being hit by flying rocks, bottles or having your equipment smashed by irate rioters photojournalists in Greece also have to calculate the possibilities of being attacked by the police when covering any kind of violent confrontation. Nor are many of these incidents simply over reaction by riot police units in the thick of the action but often happen after the violence has subsided and there are no possible excuses for mistaking a photographer for a rioting teenager. 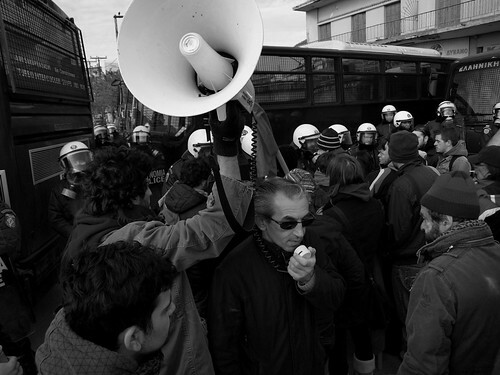 I, too was also put in hospital with a dislocated shoulder in 2007 when riot police attacked me for taking pictures of them during a peaceful march and I have lost count of the number of times I have been threatened by individual officers when covering events here in Thessaloniki. The root of the problem is that the police force (or ELAS as it is known in Greek) operates as if it were above the law and officers know that whatever legal action is taken by the victims of their violence colleagues and superiors will be more than willing to cover for them in the unlikely event of the case reaching court. As the documentary by Reportage Xoris Synora (Reporting Without Borders) on the killing of Grigoropoulos, shot by a police officer in 2008 shows they will even go as far as perjury and alteration of evidence in order to protect their own . It's little wonder then that Greece dropped 35 places to 70th position (the lowest in the EU) in the Press Freedom Index in 2010. The organisation reported that the precipitous decline in press freedom in Greece was in large part to a series of attacks on reporter which went unpunished. As times get harder and the government uses the police more and more to contain discontent and frustration felt by Greeks the chances are that such cases on abuse of authority will multiply so making the job of anyone wanting to cover anything other than press conferences and political party photo-ops even more difficult. Yesterday (Sunday, December 12th) another reporter was attacked while covering a story in Kretea. A presenter for Alter TV news was beaten about the head by a member of the MAT (Greek riot police) while covering protests by inhabitants of the area over the construction of a new rubbish dump. 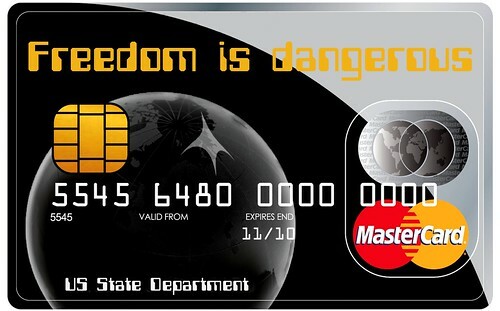 The new Mastercard Freedom Card - Inspired by the US State Department, originally uploaded by Teacher Dude's BBQ. "The website of MasterCard, the international credit card, has been hacked and partially paralysed by hackers, in apparent revenge for the payment network's decision to cease taking donations to WikiLeaks. A group of online activists calling themselves Anonymous appear to have orchestrated a DDOS ("distributed denial of service") attack on the site, bringing its service at www.mastercard.com to a halt for many users." 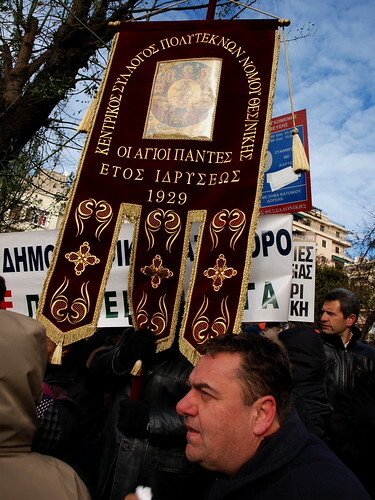 Greek students mark second anniversary of death of Alexandros Grigoropoulos in December 2008, originally uploaded by Teacher Dude's BBQ. For most people the defining moments of their life usually come during youth when we still have the passion and energy to give a damn about the world around them rather than just sit on the sofa and curse at the TV screen. For me, however that experience came to me in my forties, hardly an age given over to violent uncontrollable emotion, Yet something in me was woken by the news that police officers had gunned down a 15 year old for no apparent reason in central Athens. I cannot say what I expected when I joined a demonstration on the following morning, an uncharacteristically warm Sunday morning. perhaps a small march with a few hundred (if that) politically active students which would last about an hour before everyone went back home or grabbed a bit to eat. Instead thousands of people of all ages appeared and then more and still more till the marcher numbered anywhere near 10,000. But as well as the larger than expected turn out I noticed other, more worrisome signs such as the guys rapidly stuffing the necks of beer bottles with cloth. From the beginning there was a feeling of anger and rage from many in the march, an undefinable sense that some unwritten covenent had been broken and that it wasn't business as usual. 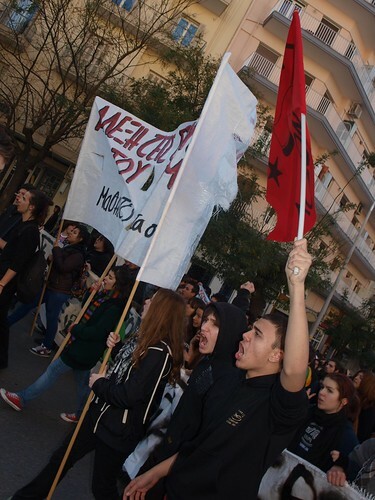 That was confirmed when the march verred off its usual route and made its way to the central police station in Aristotelous Square. Moving a little ahead of the front of the crowd I witnessed the first wave of clashes between protesters and riot police, a scene that would be repeated endless times over the following month in Thessaloniki and every other Greek city. The police responded with endless rounds of tear gas and baton charges yet, almost miraculously people scattered then reformed, determined not to be intimidated by them. The rage and anger towards the police then mutated as the protests went on day after day into a general sense of violent discontent with the authorities in general. Witnessing these events reminded me of all the account I had read of the student revolts of the late Sixties including Paris in 1968. Yet these protesters were not just teens or college students but rather came from virtually every age group including pensioners who red with anger would hurl the most furious insults at police officers. The other aspect of the events of December and January was the sense of unreality that came from listening to the mainstream Greek media's account of the events which ranged from clueless to perneciously misleading. At a loss to explain a revolt which owed nothing to traditional party politics they attempted to describe it either in terms of mindless hooliganism or shadowy conspiracy theories. It was then that I realised the true power of internet tools such as Twitter, Facebook, Youtube and blogs as they quickly proved a far more reliable source of information than TV stations which lumbered through the crisis like a half-blind brontosauras. Two years on the conditions which fuelled the massive protests of 2008 have worsened still further and the anger feel by many then has grown and intensified as people feel betrayed by their leaders. The ruling political caste seems even more cut off from its popular grassroots support than ever before and seem oblivious that they are standing in the middle of a pool of petrol flicking cigarette butts into the void. If the USA and UK are going to act like totalitarian regimes they could at least learn from governments that do not pretend to protect freedom of speech. Greek high school student mark second anniversary of death of teen in 2008- Thessaloniki, Greece, originally uploaded by Teacher Dude's BBQ. 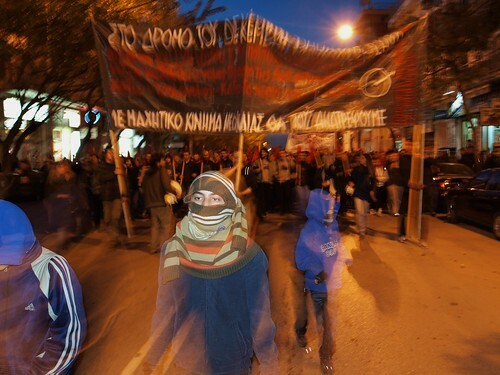 Berween five and six thousand stuent took part in marches to commemorate the second anniversary of of Greek teenager, Alexandros Grigoropoulos who was gunned down by a police officer in 2008. The death sparked off a wave of riots and violent demonstrations that lasted for over a month. While the event passed off peacefully in Thessaloniki there were serious clashes between protesters and riot police in central Athens and several other cities. 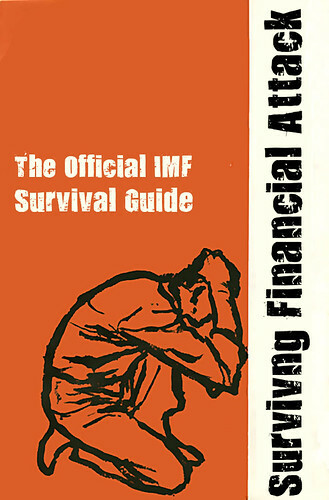 Surviving Financial Attack - The Official IMF Survival Guide, originally uploaded by Teacher Dude's BBQ. Bedtime For Bezos - Amazon drops Wikileaks from servers. Bedtime For Bezos - Amazon drops Wikileaks from servers., originally uploaded by Teacher Dude's BBQ. 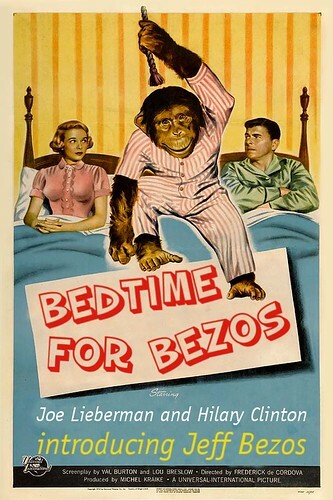 See that loveable chimp Bezos make a monkey out of freedom of speech in this hilarious new movie by Amazon. You'll laugh, you'll cry, you'll damn those fuddy, duddy old Founding Fathers for making its so difficult to ban opinions you hate." 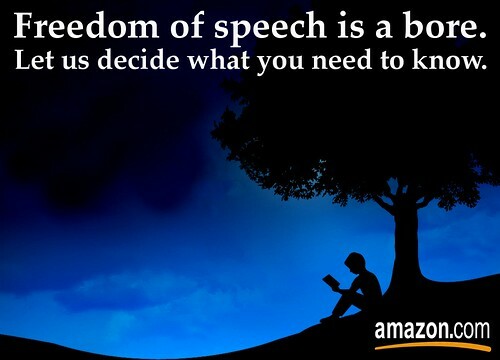 Amazon knows best - Let us decide what you need to read. Amazon knows best - Let us decide what you need to read., originally uploaded by Teacher Dude's BBQ. "By mid-morning, attempts to access the original Wikileaks.org Web site produced only a page saying: “The address is not valid.” The new domain name, Wikileaks.ch, appeared to be providing only sporadic access to the site. The action by EveryDNS.net, which provides around 500,000 Web sites, followed a decision on Wednesday by Amazon.com Inc. to expel WikiLeaks, the whistle-blowing organization, from its servers, although it remains on the servers of a Swedish host, Bahnhof, as it continues to anger the United States by publicizing a huge array of some 250,000 leaked State Department documents relating to American foreign policy around the globe." 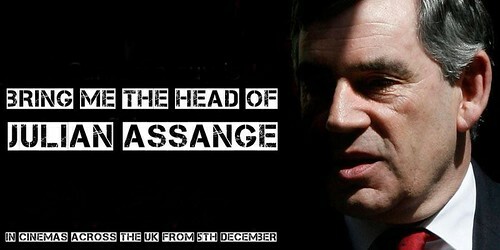 Bring Me The Head of Julian Assange - Gordon Brown's latest blockbuster, originally uploaded by Teacher Dude's BBQ. "The US embassy in London wrote off Gordon Brown within a year of his arrival in No 10 after concluding that an "abysmal track record" had left him lurching from "political disaster to disaster", according to cables released by WikiLeaks. In a scathing assessment of the former prime minister, George Bush's last ambassador to London blamed Brown for presiding over a "post-Blair rudderlessness" which prompted senior Labour figures to complain of their despair to the embassy." ΠΑΣΟΚ - ΔΝΤ: I love you. ΠΑΣΟΚ ΔΝΤ, originally uploaded by Teacher Dude's BBQ. Το σήμα "PASOK" είναι εμπορικό σήμα της "International Monetary Fund" (εφεξής "ΔΝΤ").Μην χρησιμοποιείτε κανένα εμπορικό σήμα του PASOK κατά κανέναν τρόπο που εκφράζει ή υπονοεί σχέση με την εταιρεία Panhellenic Socialist Movement Greece, χορηγία, υποστήριξη, πιστοποίηση ή έγκριση. Μην χρησιμοποιείτε κανένα Panhellenic Socialist Movement Greece εμπορικό σήμα του κατά τρόπον που υποδηλώνει ότι η εταιρεία συνδέεται νομικά με την εταιρεία σας. Πρέπει να προβάλλετε της εταιρική σας επωνυμία πιο έντονα από οποιοδήποτε εμπορικό σήμα του PASOK σε όλα τα υλικά. Has it come to this?, originally uploaded by Teacher Dude's BBQ. In the early 90's the USSR collapsed and thousands of ethnic Greeks fled the warring the ex-Soviet Union republics to Greece to escape poverty, war and ethnic conflict. However, at least in the beginning most came with just what they could carry and the maximum $50 allowed in foreign exchange. In the years that followed these refugees were a common site in the street markets of Greece as they sold whatever possessions they had to earn money. Now such sights are once again becoming more and more common on the streets of Athens, Thessaloniki and other Greek cities as people, especially retirees struggle to get by on tiny pensions. 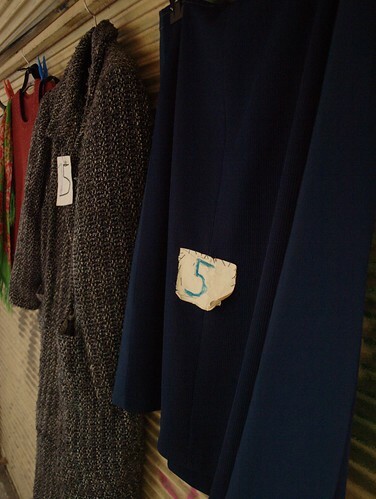 It breaks your heart to see people who have worked hard for decades, struggled to raise families and carve out a life wth dignity reduced to such extremes, forced to sell childens' discarded toys, worn out shoes and their winter clothes just to survive. "And if all others accepted the lie which the Party imposed—if all records told the same tale—then the lie passed into history and became truth." Unlike the pontiffs of old Greek prime minister Giorgos Papandreou seems able to be an unlikely follower of the dogma of papal infallibility in which a move from one theological/ideological position to its exact opposite can be achieved without having erred in either case. On 23rd May Papandreou stated categorically to El Pais that Athens would not ask for its mountain of debt to be restructured, a position he repeated in a BBC interview in September and on 16th November to El Figaro, going so far as to say such a move would be a "disaster for Greeks". Yet just last week the IMF/EU/ECB decided to extend the payment schedule for Greece's bailout out package from five to 11 years and this is now being hailed by the government and much of the media as a kiss of life for the country. It's interesting to see how the state run channels and pro-government TV stations such as MEGA, Skai and Antenna have promoted this latest change of heart without the slightest reference to previous government statements which held that such policies were not in the nation's interest. 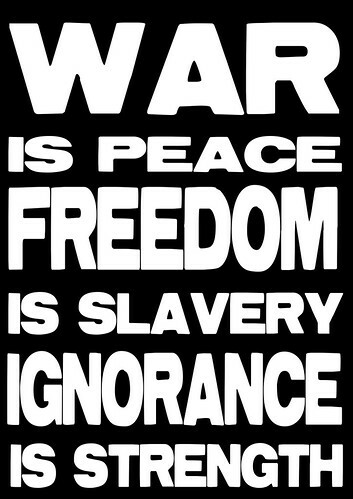 In a repelling way it is fascinating to see how the ideas George Orwell espoused in 1984 are still revelent is a seemingly democratic regime with a free press. The truth, however, is the press in Greece is neither free nor independent but rather beholden to powerful political and economic interests which limit the parameters of what is acceptable in terms of political discussion. One only has to compare the rough ride given Ireland's ruling politicians following their bailout with the servile treatment of their Greek counterparts by local media. In many repects its hard to tell the difference between the official government line and that taken by the reporters who are covering domestic political matters. The reality of the matter is that the press have sided with those in power in the hope of persuading ordinary Greeks that the massive social and economic dislocation they are suffering is inevitable and that any possible protests against PASOK's austerity measures are futile and anti-productive. This may, indeed by the case, but the stiffling of free and open debate about the options Greece has in the face of the current economic crisis is both dangerous and short sighted as it is steadily undermining respect for the government and democratic institutions in general.